…without providing your email address. Image source. As conversion-driven marketers, we’re always on the lookout for ways to improve the results of our campaigns. Most of us follow the accepted practice of putting high-value content — usually an ebook or training series — behind an opt-in form on a landing page. But not everyone accepts this as best practice. Some marketers, such as David Meerman Scott, believe content should be freely accessible because it results in more downloads and better brand perception. Part of the reason the content gating debate remains unsettled is that it’s hard to conclusively test gated campaigns against their ungated counterparts. Comparing campaigns that are structured so differently with different KPIs can feel like comparing apples and oranges. 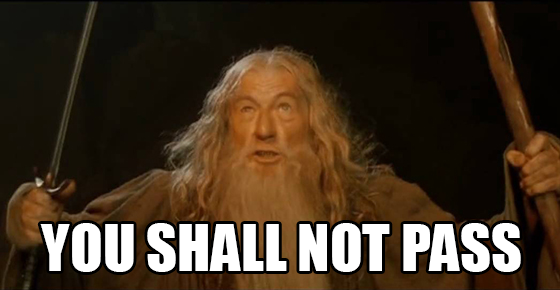 Should content be left ungated, or is gating content a necessary evil? If so, is it possible to create a content gate that doesn’t turn people away? Here are some strong arguments from either side of the debate – and some tried-and-true gated content campaign optimization tips. As CEO of HubSpot, Mike keeps his eye on the bottom line. He admits that fewer people download gated content. But he believes the people who fill out a form have essentially prequalified themselves and are, therefore, higher quality leads. For Mike, the debate essentially comes down to what data you value most. Is it views you’re after or qualified leads? “If I can get 100,000 people to see that page and I can get 28,000 people to fill it out, 28,000 contacts may be more valuable than even 50,000 people seeing the content. Gating your content helps you identify qualified leads who want to be nurtured. Copyblogger’s chief copywriter, Demian Farnsworth, believes that gating content helps you build a relationship with your ideal prospects. And that’s exactly what drives optins: trust. Trust drives optins. Gating your content helps build a relationship with your leads. While Demian believes a gate can help you build relationships, Ian Rhodes believes you can build relationships better without the gate. “I don’t believe in content gates for one simple reason. If the information you’re putting out is truly worthy of my time, I’ll naturally want to receive more. I’ll be hooked. Rather than putting his stock in leads, he’s looking for advocates – people who know what you believe in and want to put your ideas into practice in their business. And interestingly, he’s found a practical way to gather emails from people without resorting to an optin form. 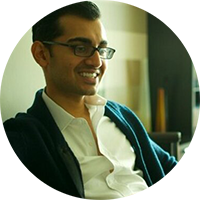 Conversion expert Neil Patel, co-founder of KISSmetrics and Crazy Egg, doesn’t recommend gating your content. 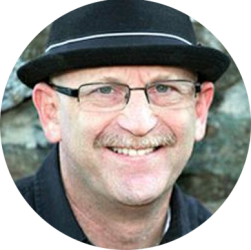 A strong advocate of content marketing, Neil has been creating “advanced guides” since 2013: in-depth ebooks that teach readers advanced marketing tactics in a variety of topics – and he leaves every one of them ungated. One, which he and I co-authored, is 40,000 words, a veritable book. But he has never charged a dime for it. The return on his investment isn’t leads. It’s traffic. I asked Neil for his take on the debate. “From my experience, gating content creates a lot of backlash. 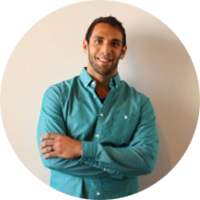 He uses optin forms, but judging from his own content marketing efforts, he favors giving away a lot of value without asking for anything in return. For him, not “ticking people off” is the smarter approach. The raging debate continues as supporters of either side continue to see promising results that back up their stance. Though each of these marketers brings an interesting perspective to the table, the only way to know what works best for your campaigns is to always be testing. When in doubt, gated content campaigns produce immediate, tangible feedback in the form of collected leads. This makes optimizing these campaigns (and gauging whether your conversion optimization efforts are working) relatively straightforward. For this reason, I decided to pick a side and explore what works when gating your content. Is it possible to create a content gate that doesn’t turn people away? 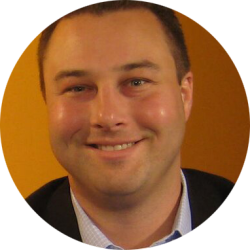 How can you get the highest number of optins possible without driving prospects away? A consummate content marketer and designer, Barry Feldman is a creative director who makes campaigns look as good as they sound. As you might guess, he puts emphasis on the creative elements of a campaign, namely, creating a landing page with optimal conversion-centered design. From his experience, that’s key to getting people to complete your optin form. “If gating your content is going to work, you’ve got to create landing pages that convert at a high percentage, particularly for personas you deem to be important to your lead generation efforts. Gated content campaigns fail when landing page visitors aren’t assured they’re in the right place. 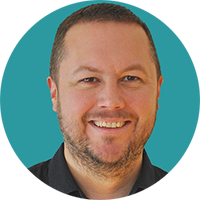 In line with Barry’s point, Mike Bal, Director of Social Media and Content at Single Grain, recommends that you keep the bar high when creating your gated content. The content behind an optin form should be significantly higher value than anything else you give them. “ Something to beware of is watering down your offer. 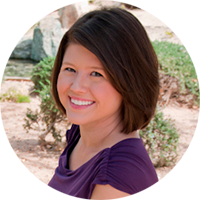 Kristi Hines, content marketer and blogger extraordinaire, believes another key to improving the conversion rate of your gated content campaigns is your reputation. “ If you have demonstrated that your content is both unique and valuable, then creating a content gate should work. Otherwise, that would be your biggest challenge — getting people to believe enough to complete the action necessary to open the gate. Authority is important. No one wants to give their email to someone they don’t know. While it’s nice to see the thought process that experts use when making these decisions, ultimately, the truth is in the numbers. 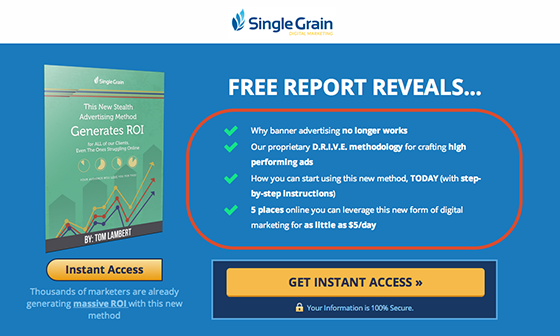 I turned to two companies that are using gated content campaigns effectively to build relationships and generate leads: Single Grain and Digital Marketer. 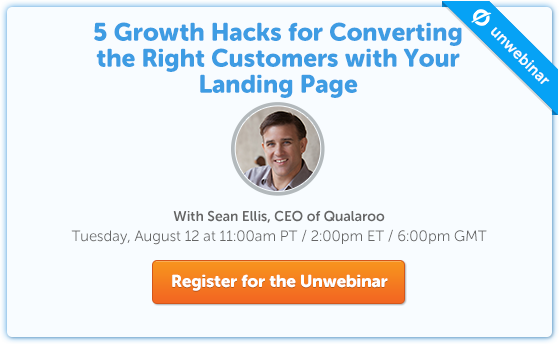 Let’s dive into why their campaigns convert. 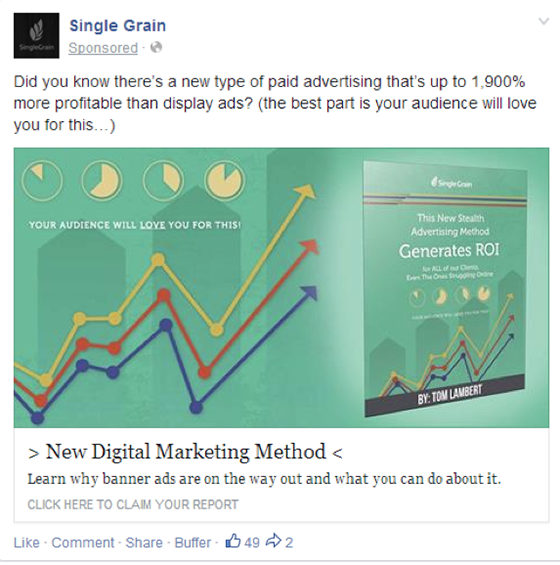 Single Grain’s content campaign starts with a Facebook ad targeting people with relevant interests (in this case, people who follow Crazy Egg). The artwork is simple and communicates that the offer is an ebook. The ad copy gives good incentive for exploring further. Who wouldn’t want information on a new type of advertising that gives 1,900% more profit than ads? Click through, and you arrive at this landing page. It’s immediately clear we’re in the right place because Single Grain employs message match by using the same ebook image as in the ad. Though the headline could be more benefit-oriented, the bullets do speak directly to benefits and do a good job of convincing me that the ebook is worth reading. The call to action, “Get instant access” communicates that I’ll get the information quickly. And since there is no form on the page, my first impression is that I may not have to opt in to anything. Not much friction here. It’s got one field, so filling it out feels relatively painless. I’m then taken to a download page, where I can immediately download the report. After download, subscribers are sent a seven-part autoresponder sequence that teaches them how native ads work (including a pitch for their services in the P.S. of each email). 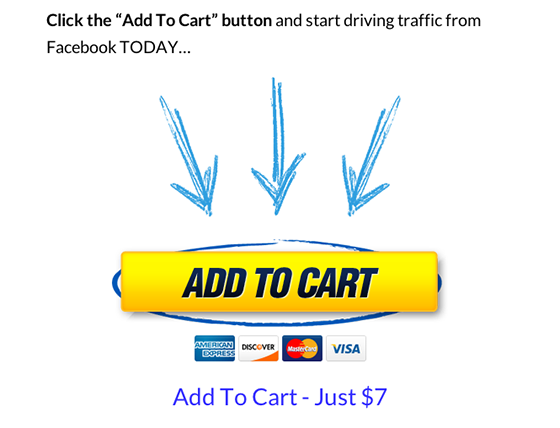 For some extra conversion power, people who landed on the landing page but didn’t opt in are retargeted on Facebook. Why does this campaign work? It speaks to a very specific pain point most marketers share (display advertising not working). The offer pre-qualifies prospects: marketers who struggle with or are interested in alternative marketing sources. The copy builds desire for the report. Not revealing the method creates an element of mystery (curiosity is the ultimate persuasion tool). There is message and design match between the ad and landing page, so people know they’re in the right place. The 2-step optin lets the prospect take a small step (a micro-commitment) before asking for their information. Now let’s look at another winning gated content campaign. The simple and direct ad features Digital Marketer’s signature design elements, so it’s easily recognizable to DM followers. The ad copy poses a question, coupled with a call to action. Notice that they also specify the number of swipes in the file. Specifics will always give you a better response than generic messaging. Immediately, I see that I’m in the right place. 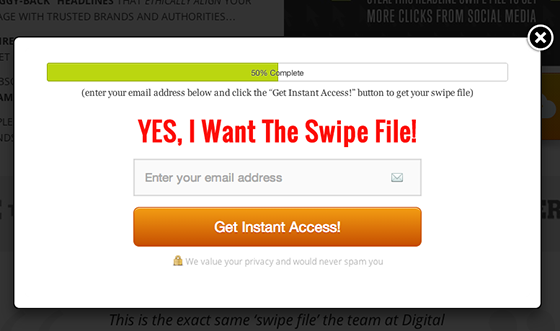 Both the distinctive artwork and the keyword, swipe file, match the ad. The persuasive headline is benefits-oriented and uses a deck, or subtitle, to give more specifics about the offer. The specific numbers included in each of the bullets convince me that I’ll get high value from this download. Any doubts I may have are overcome by the elements of social proof: well-known brand names and a testimonial. Similar to the Single Grain landing page, I see no form embedded on the page. That gives me the feeling that this may be free content (ungated), reducing friction to click on the CTA. One addition here is the completion bar across the top of the popup. This communicates that “instant access” might not come in the very next step of the process. 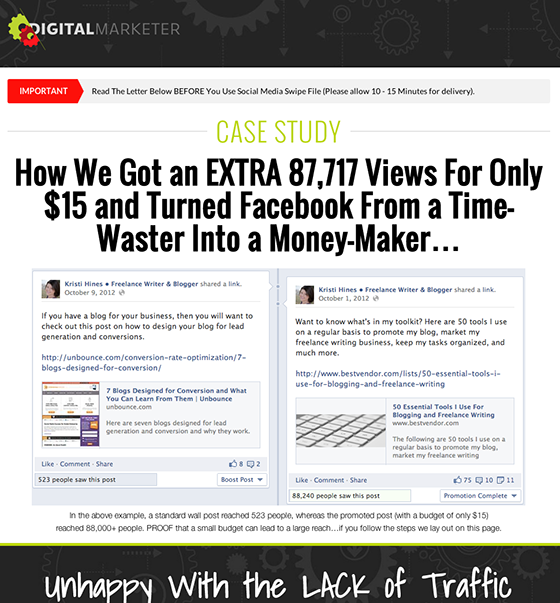 The strategy, then, is to send Facebook fans to a landing page that offers a valuable piece of content. Instead of a regular thank you/download page as we saw with Single Grain, you’re told that your free gift is on its way to your inbox and are then offered a related entry-level product for $7. Digital Marketer is leveraging the power of reciprocity here. As marketing campaigns go, this is a winner. 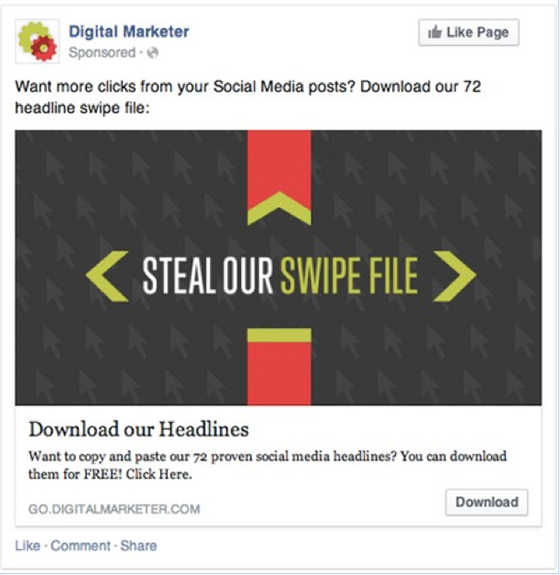 Just under 2% of the Facebook users who see the ad click on it. 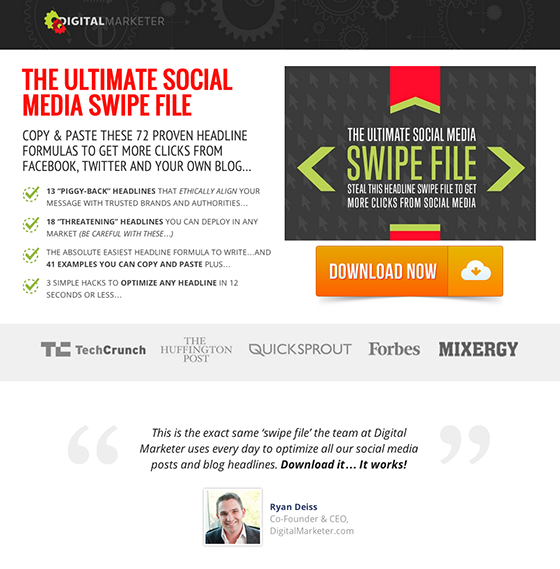 Nearly half of those people also download the swipe file, yielding more than 23,000 leads in just over a month. It speaks to a very specific pain point most marketers share (poor results from social media marketing). The offer’s copy pre-qualifies prospects: marketers who struggle with or are interested in social media marketing. The message and design match between the ad and landing page offer continuity, so people know they’re in the right place. The popup optin form reduces friction caused by the standard embedded form. 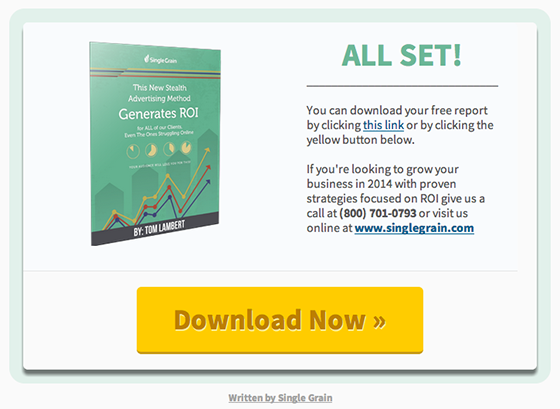 Is there a better way to generate leads than gating your content? The only way to know is to test for yourself, but these examples have shown that if you want to build a responsive list of people you can market to, putting content behind a gate works – if you do it right. Develop the highest-value content you can. Create a variety of content that always exceed your prospects’ expectations. Surprise and delight is the name of the game. Place the offer for your content in ads and native content that will be seen by your target audience. Prequalify leads so they’re less likely to bounce when they see your optin form. Keep your optin form short and sweet. 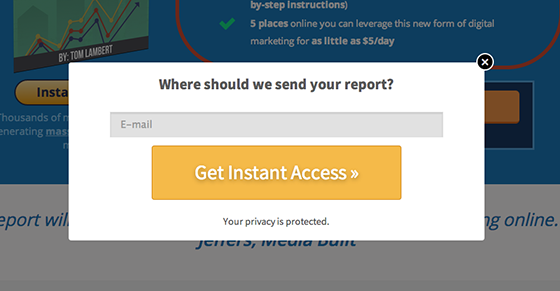 Consider testing a pop-up form, so it doesn’t feel like an extra step. Focus on the user experience throughout the entire process. All of these together will create a positive impression so people are eager to see more of your brand in their inbox. Sound easy enough? Now it’s your turn. Do you believe in the efficacy of gating content? Let me know in the comments.